I kind of live in my office--it's where I write LE CATCH after all!--so keeping its decor stylish and inspiring is pretty key. Though I'd been thinking it needed a refresh for quite some time, I just could not get around to it. Too much to do! Then One Kings Lane called and asked me if I'd like some help. Um, yes please! It all came together so quickly, so fabulously, so spot on--so me! I truly love it and I think you will too. 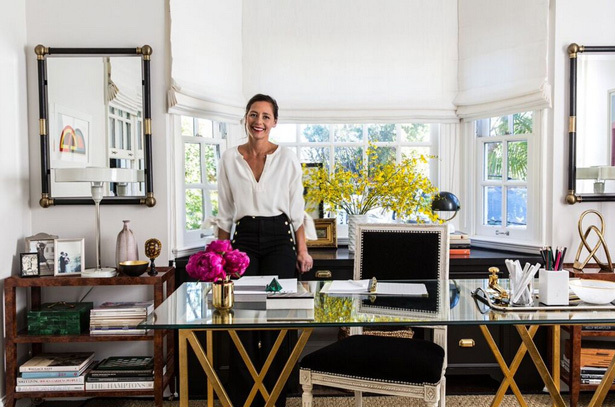 Check out my gorgeous new office, and all the amazing pieces--all shoppable, of course--here! Love the office makeover! Can you share the source of those great pants you're wearing? Marlien - could you post sources for your top and sailor-style button pants in this first shot? Looks amazing! I would love to hear about your outfit as well! And are those Chanel slingbacks? Love!! What pants are you wearing? Fab office revamp. Love it. Love your cream top. Who makes it? Proof of your ability to mix high and low, as you describe about yourself on your 'about' page. How many people love your jeans, and they're H&M! Love it, and your blog -- and the office makeover is my dream office. Congrats and hope you're happy with it. 8-9 hours of my day pass in the office. This is my second home and I think it must be cozy and well organized. I like the interior design of office on the pictures. Well done! For me is very important to change the environment in the office. I spend most of my time there and the most iportant thing is to feel comfortable there. i'd be happy to take your old roman shades (schumacher floral!) off your hands;) - my favorite!! Love it...in the middle of redoing my studio and I am stumped as to where my printer should go.